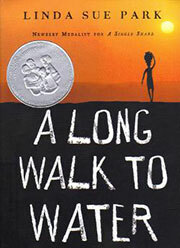 Have you read A Long Walk to Water by Linda Sue Park? It’s been on the New York Times paperback bestseller list for 40 weeks as people around the world take to heart the lives of people in the Sudan who must walk for hours each day to get the water that sustains their lives. Based on a true story, this book will spur you on to Doing Something about water, even if it’s turning the faucet off while you brush your teeth. Many classrooms have been motivated to raise money to dig a well in South Sudan.